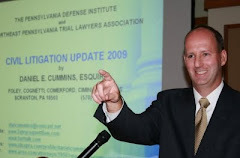 According to a May 26, 2010 Times Leader article by Terri Morgan-Besecker, the attorney for Erie Insurance Company, which sought to overturn a $1.2 million arbitration award that was reportedly the basis of corruption charges against former Judge Michael Toole has filed papers to terminate the case with the court. Michael Blazick, attorney for Erie Insurance Exchange, filed a discontinuance in the Luzerne County Court of Common Pleas on May 3, 2010 that ended the case. There was no indication as to whether the case was terminated because a settlement was reached or because the insurer decided to drop the matter, however. By way of background, Erie filed a petition in January that sought to overturn a Dec. 18, 2007 underinsured (UIM) motorist arbitration award issued to the injured party, arguing it was the product of fraud, corruption and misconduct involving, in part, the selection of the neutral arbitrator. The petition was based on Toole’s guilty plea in December to charges relating to his handling of an uninsured motorist insurance arbitration claim. Here's a link to the Times Leader article on the topic: http://www.timesleader.com/news/Toole-linked_case_appeal_withdrawn_05-26-2010.html.